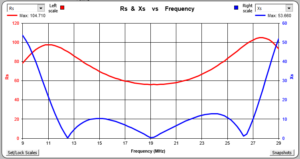 The sign of reactance – a challenge posed a problem, a set of R,|X| data taken with an analyser of a quite simple network and asked readers to solve the sign of X over the range, ie to transform R,|X| to R,X. It is widely held that this is a trivial matter, and lots of software / firmware implement algorithms that fail on some scenarios. Though the scenario posed was designed to be a small set that provides a challenging problem, it is not purely theoretical, the characteristics of the data occur commonly in real world problems and the challenge data is derived from measurement of a real network. The network measured is comprised from analyser, a 2.8m length of RG58/CU, a tee piece feeding a 50 resistor on one branch and on the other branch, another 2.8m length of RG58/CU with a 4.7Ω resistor termination. 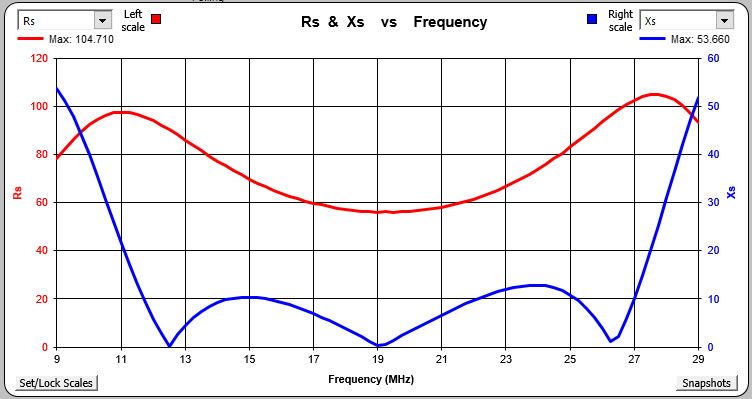 Over time, readers of The sign of reactance have suggested that determining the sign of reactance with an antenna analyser that does not directly measure the sign is not all that difficult, even for beginners. The article shoots down some of the most common algorithms as failures on simple cases. Here is the data from measurement made with an AA-600 and then all – signs removed, so in fact the Xs column is |Xs|. 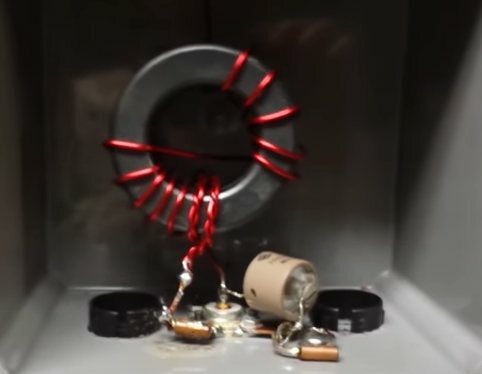 "Zplots file generated by AntScope"
Ellington describes in a Youtube video his high power matching transformer for an EFHW, he rates it suited to 500W CW. Like almost all such ‘designs’, they are published without supporting measurements or simulations. The transformer is intended to be used with a load such that the input impedance Zin is approximately 50+j0Ω, Gin=0.02S. Analysis of a simple model of the transformer with a load such that input impedance is 50+j0Ω gives insight into likely core losses. 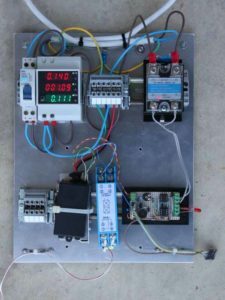 This article expands on A flexible test panel for microcontroller based power control projects with some enhancements and accessories. A LED power meter that I had ordered finally arrived (slow boat from China syndrome). This is a 2017 update of an article written originally in October 2005, earlier editions published on VK1OD.net which is now offline. Over recent years to 2002, the number of issued amateur licences was declining, the trend was about 2.8% pa decline over the five years to 2002. Is a ham transmitter conjugate matched to its load? 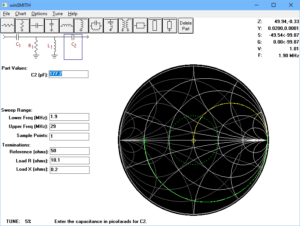 Following on from KL7AJ on the Conjugate Match Theorem, KL7AJ on the Conjugate Match Theorem – analytical solution asked the question Is a ham transmitter conjugate matched to its load? The answer speaks to the relevance of Walt Maxwell’s Conjugate Mirror proposition to ham stations. 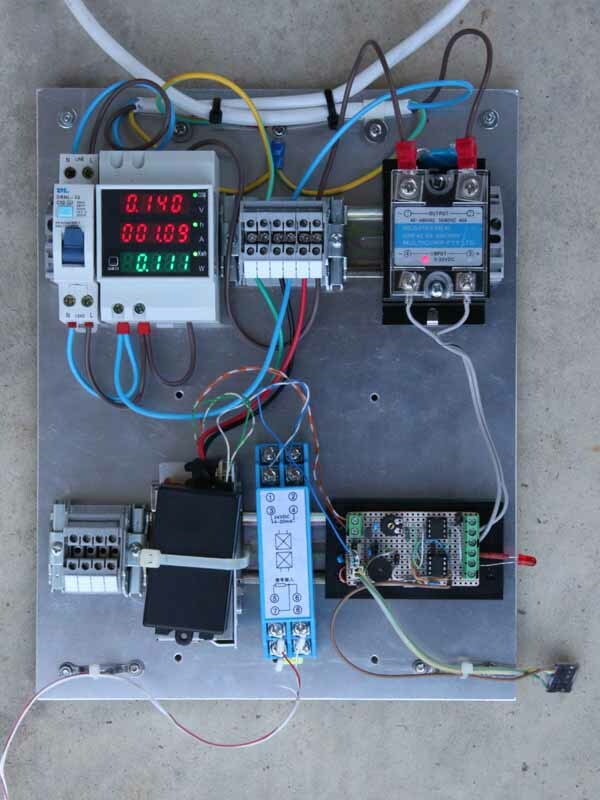 Continue reading Is a ham transmitter conjugate matched to its load? KL7AJ on the Conjugate Match Theorem asked the question Should we have expected this outcome? Let us solve a very similar problem analytically where measurement errors do not contribute to the outcome. Taking the load impedance to be the same 10.1+j0.2Ω, and calculating for a T match similar to the MFJ-949E (assuming L=26µH, QL=200, and ideal capacitors) we can find a near perfect match. The capacitors are 177.2 and 92.93pF for the match. One of the most useful (and sometimes astonishing) principles in radio is the Conjugate Match theorem. In the simplest terms, what this says is that the maximum power will be transferred between a source (like a transmitter) and a load (like an antenna), when the source impedance is the COMPLEX CONJUGATE of the load impedance (or vice versa). Here’s a neat little experiment to prove the conjugate match theorem. 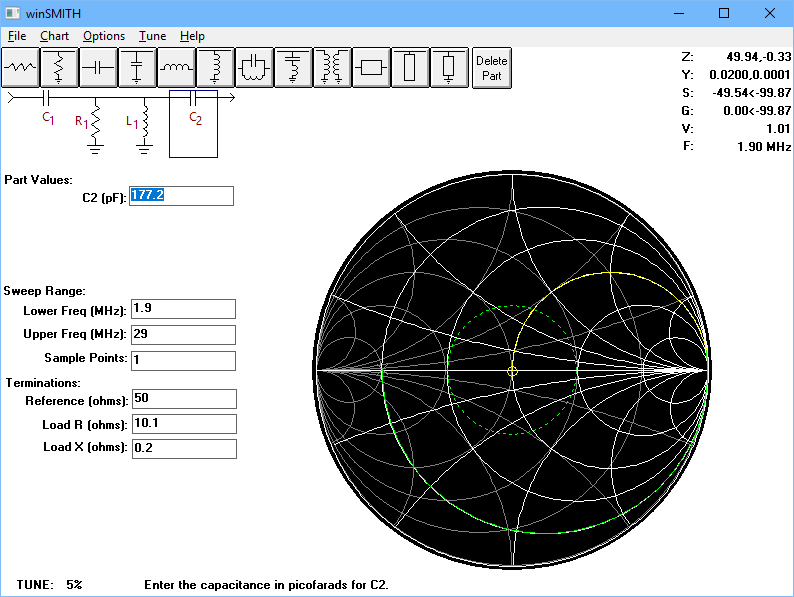 You need four basic ingredients: an antenna analyzer like the MFJ259 (or an actual impedance bridge, if you know how to use one). A good low loss antenna tuner. A good 50 ohm resistor. And a good 200 ohm resistor. And some appropriate connecting hardware, namely some short bits of coax. Step 1) connect the 50 ohm resistor to the OUTPUT of the antenna tuner. Connect the antenna analyzer to the INPUT of the antenna tuner. 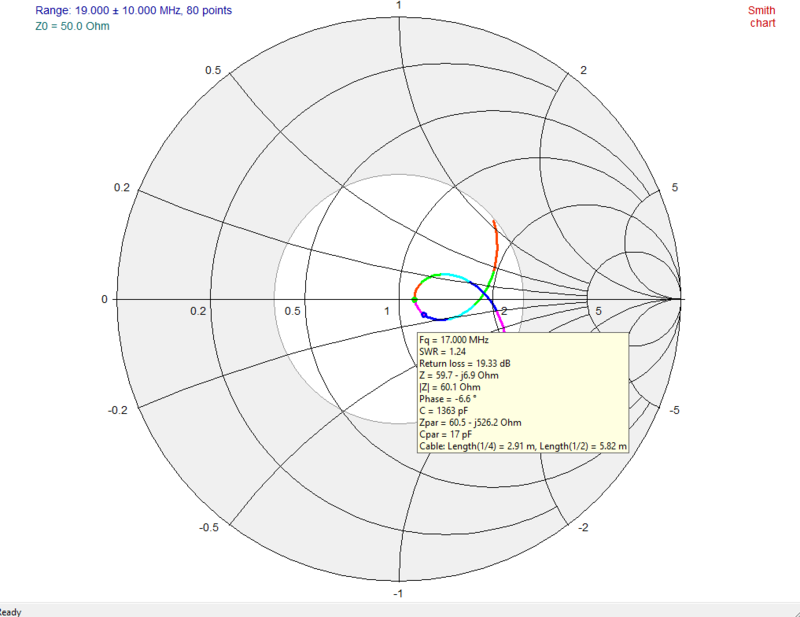 Step 2) Adjust the antenna tuner to get precisely 50 ohms, zero reactance on the antenna analyzer. This step simply confirms everything is working. Step 3) Replace the 50 ohm resistor with the 200 ohm resistor. Readjust the antenna tuner to get 50 ohms, zero reactance on the antenna analyzer. Do not disturb the antenna tuner adjustments after this point. Step 4) Remove the 200 ohm resistor and insert the antenna analyzer in its place (at the OUTPUT of the antenna tuner). Step 5) Insert the 50 ohm resistor at the INPUT of the antenna tuner. 10 points for anyone who will correctly explain why this works. Jacobi published his maximum power transfer theorem in 1840. It states that maximum power is transferred from a (Thevenin) source to a load when the load resistance is equal to the (Thevenin equivalent) source resistance. It was later adapted to apply to AC circuits with sinusoidal excitation, maximum power is transferred from a (Thevenin) source to a load when the load impedance is the complex conjugate of the (Thevenin equivalent) source impedance.